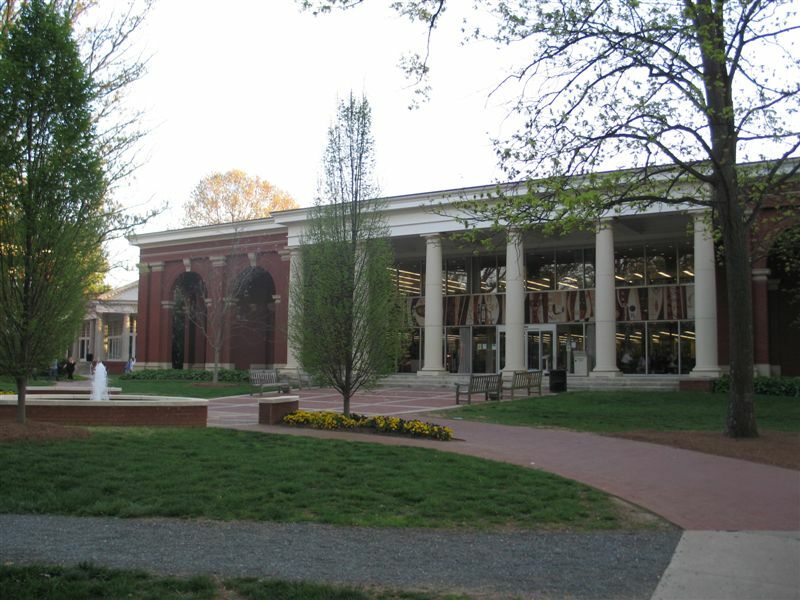 Everett Library, located in the heart of Myers Park, houses a collection of more than 60,000 books and videos and approximately 100 print periodicals in open stacks. 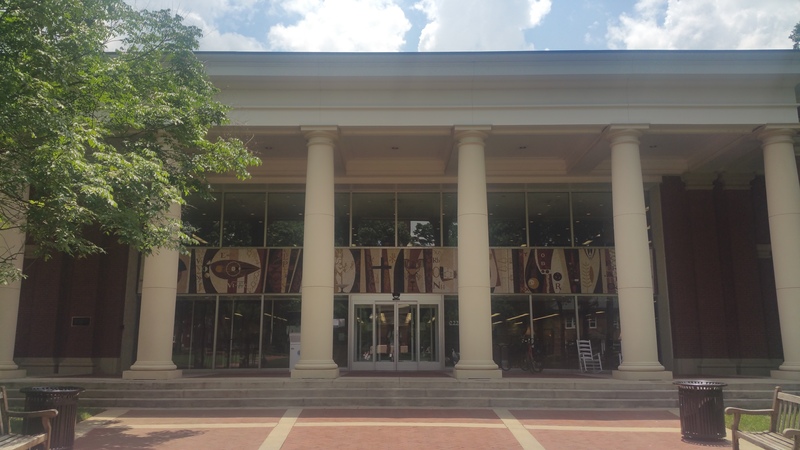 Additionally, the Library offers access to a wide range of electronic resources including e-books and academic databases to support scholarship and inquiry at Queens University of Charlotte. Our Special Collections, a series of focused compilations which enrich the scholarship and knowledge of the overall library collection, contain a wide range of historical and archival materials as well as works of art and academic inquiry. The library provides access to two separate computer labs, one of which consists of Macintosh computers. Everett Library is also home to four reading rooms which offer space for private and group study. Internet access is available at all public workstations in the library. Wireless network access is available throughout Everett. Our coffee shop provides refreshment and a place for group work, study, and socialization. Come see us today! Built in 1960, the contemporary design of Everett Library uses an open modular plan that has three advantages: quick, direct access to the book collections, greater flexibility in arrangement of shelving and furniture, and centrality of staffing areas. The original architectural design was a contemporary 1960s white pebble exterior by J.N. Pease & Co. 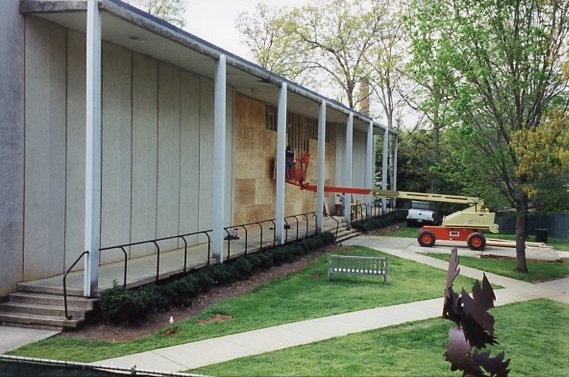 In 2000, Mr. John H. Sykes, Trustee of the University, donated the funds for a new portico renovation and an update of the library's information technology wiring. Now a traditional Georgian style façade, mirroring the architecture of Queens' original buildings, unifies the campus. The portico is dedicated to his wife Susan W. Sykes. 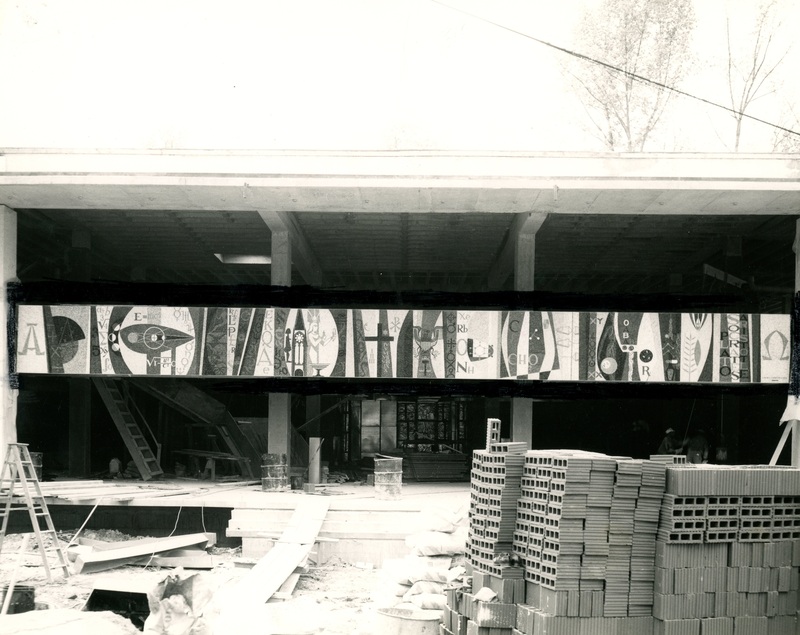 The central spandrel, a focal point for the original façade, is a 6-by-60-foot mosaic tile mural designed by the American muralist, Edmund Lewandowski. The mural depicts the fields of knowledge included in a college library. Its unity comes from the first, last, and central section. The Alpha and Omega of the first and last panels relate to the center section, which presents a number of religious symbols signifying the Presbyterian affiliation of the college. Everett Library at Night, circa 1960.
Who the "heck" is Herschell Everett? Everett Library is named in honor of Herschel H. and Cornelia Nesbit Everett. A long-time resident of Charlotte, Herschell Hill Everett was a successful businessman with a chain of 88 movie theaters and other business interests in the Carolinas. He was Charlotte’s “Man of the Year” in 1952 and also active in civic affairs serving as President of the Charlotte Chamber of Commerce, directing public fund-raising to build Freedom Park, and service on local trustee boards for local business and religious organizations. He served as Chairman of the Board of Trustees for Queens from 1952-1967 and Acting President of the College in 1953-1954. Everett’s accomplishments in his long service to Queens cannot be understated. For example, at the beginning of Everett’s time as chairman of the board, Queens had approximately 475 students and 43 faculty members. 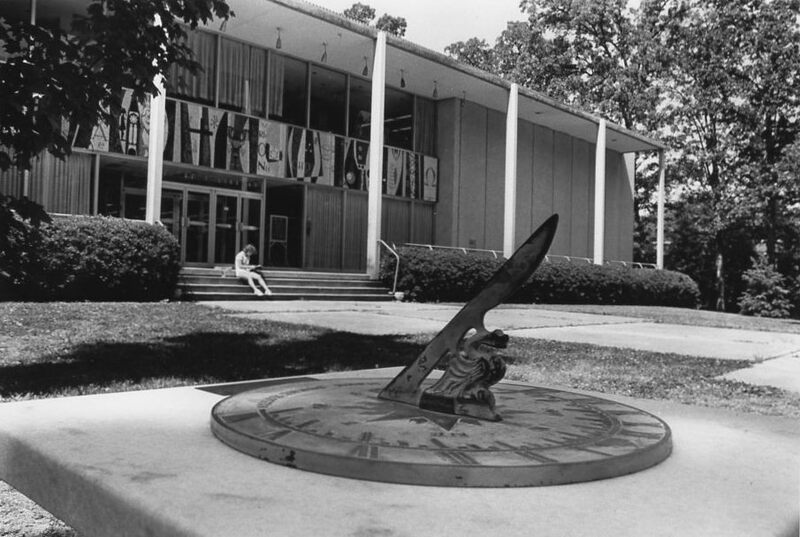 Just five years later, the numbers had increased to 850 students and 69 faculty members. 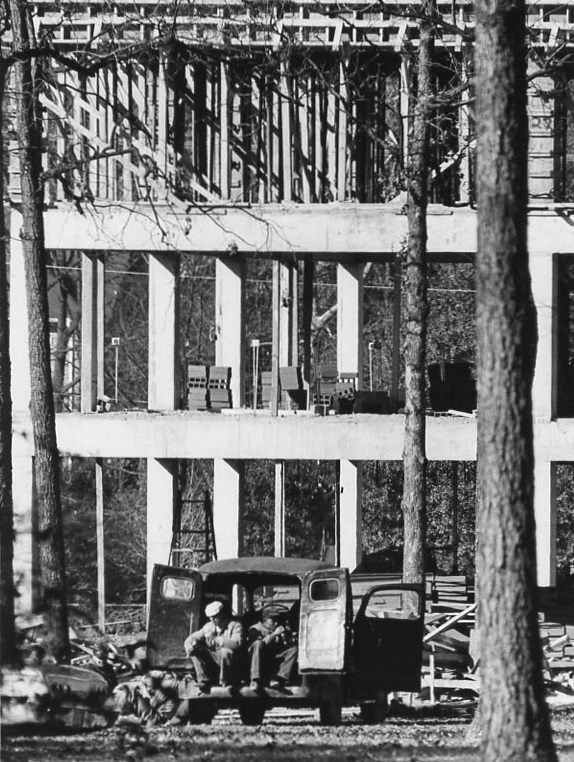 During the late 1950s, construction of a new library building commenced and upon its opening in 1960, was named for the Everetts in appreciation of service by the Board of Trustees of Queens College. His name on the library recognizes H. H. Everett’s dynamic leadership, intense loyalty, and long-serving contribution of time and effort to Queens. Today Everett Library is a dynamic full-service knowledge portal serving the needs of students, faculty, and staff both on campus and remotely using modern technology to meet the information needs of all. In addition, the physical structure is changing to accommodate new modes of learning with collaborative spaces, quiet study and contemplation, maker/creation spaces, and a coffee shop. We think “Heck" Everett would be proud. Alpha and Omega was designed and created by American Precisionist artist Edmund Lewandowski. In working with mosaic as a medium of mural decoration, I believe the artist must learn to utilize his skill to conform within the function of the architecture. It goes without saying that the artist wants a work of art, but he must not consider his work as an independent piece of art, but rather one which has a very direct and harmonious relationship with the architecture, the setting of the work he is contemplating. The same can be said of Alpha and Omega for it is an integral part of the design for Everett Library; in form, in color, and in symbolism it complements the building. The artist chose his basic red and red-brown color tones from the earth around the building and from the brick of adjacent campus structures. 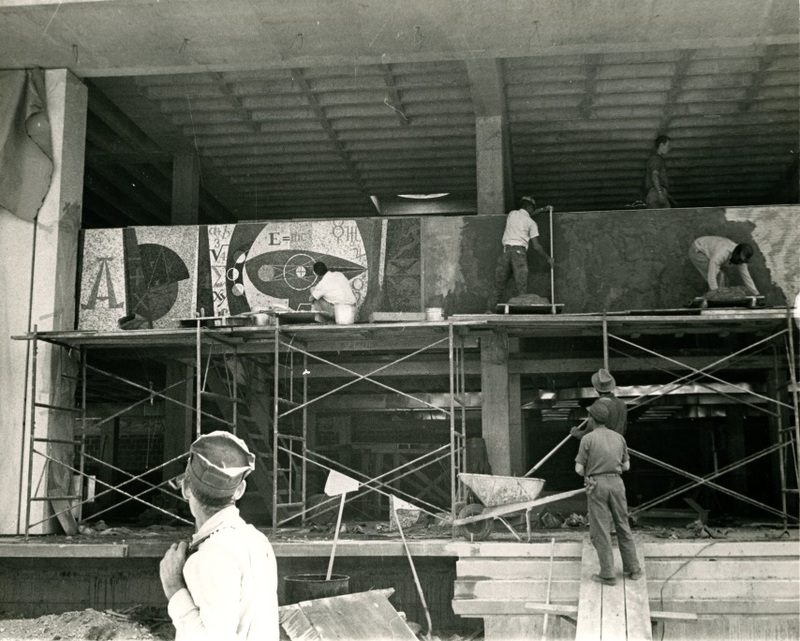 Workers look on as Edmund Lewandoski creates the mural. The mural measures five feet by sixty feet and is composed of some 250,000 piece of colored stone and tile. 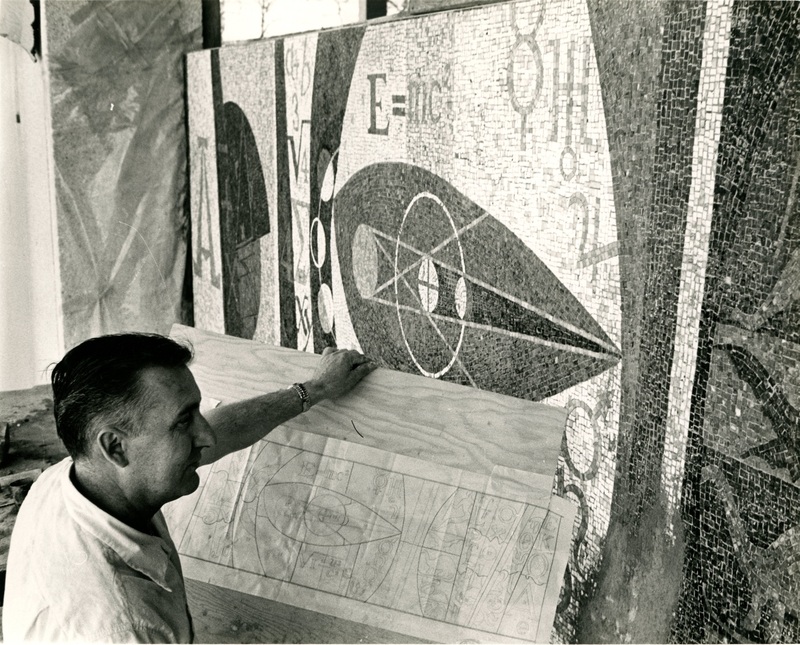 The design of the mural is made with small pieces of Italian tile, and the background is of broken surface marble. The brilliantly colored tesserae were imported from Murano, Italy. The mural is a representation of the fields of knowledge included in the materials of a college library. Consisting of three panels, the Alpha and Omega of the first and last panels are related to the central section which presents a number of religious symbols signifying the Christian affiliation of the college in its institutional life as well as in its education ideals. 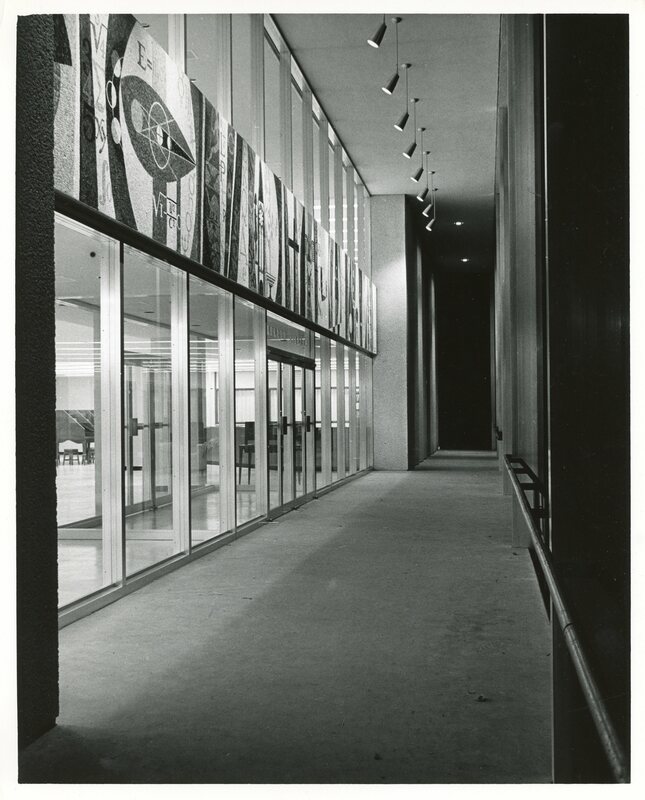 Alpha and Omega waiting to welcome generations of students through the library doors, 1959. The first set of panels depicts mathematics by employing symbols that are characteristic of that field of knowledge. This includes symbols and formulae for astronomy and physics. The second group of panels represent the Humanities. Here are references to eras of geological time. The next panel is related to economics and employs symbols for monetary systems from around the world. The following three panels represent language and literature.The next panel has an oval-shaped light background represents various forms of art, including a figural representation of African sculpture and elements of Gothic and Romanesque architecture. The human figure shown is symbolic of both dance and Greek as well as Egyptian influence. Finishing this section out is a Greek libation cup and a panel devoted to symbols in music. 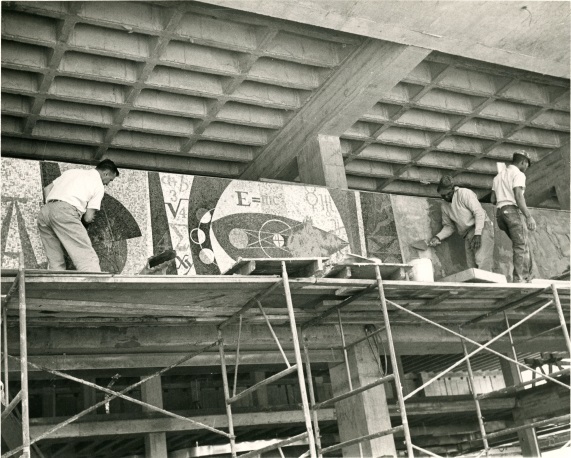 The creation of the mural coinciding with the construction of the library in 1959. The middle set of panels represents various forms of religion. The panel on the left is the Ichthus which has traditionally represented "Jesus Christ, the Son and Saviour". The dominant symbol in this group is the cross which is rendered in black for high contrast and mood. Included are representations for the Ten Commandments as well as symbols for Islam, Judaism and the Chi Rho symbolizing Christ. On the right side of this group are two half-arches characteristic of architectural design in the church. The next panel is devoted to law and government, with the scales and gavel representing law, and the eagle representing government. The following group of panels represents various forms of chemistry through symbols of elements and formulae. Two panels at the right of these typify industry by a stylistic representation of spindles and shuttle, which are drawn from the textile industry. The next group of symbols is related to biology, physiology, medicine and nursing. The panels include forms of cell structure, cross sections of protoplasm, the suggestion of the human figure, blood types, and symbols characteristics of medicine and nursing. With the use of wheat and a pollination diagram, food and agriculture are symbolized in the next panel. The three panels with the names Plato, Socrates, and Aristotle represent both philosophy and the cultural heritage of the Greeks. The last panel is Omega referring to the first panel and to the center section on religion. 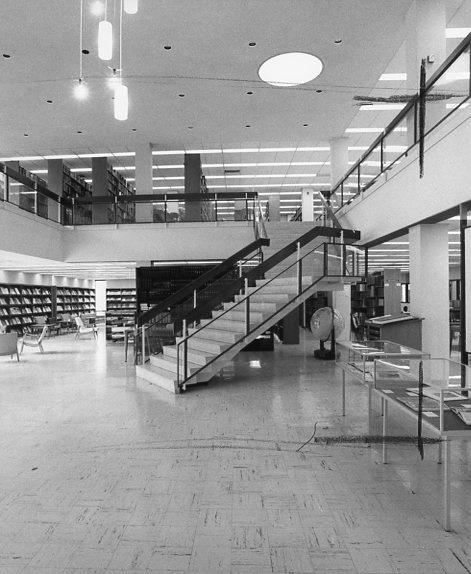 Interior of Everett Library, mid-1970's. 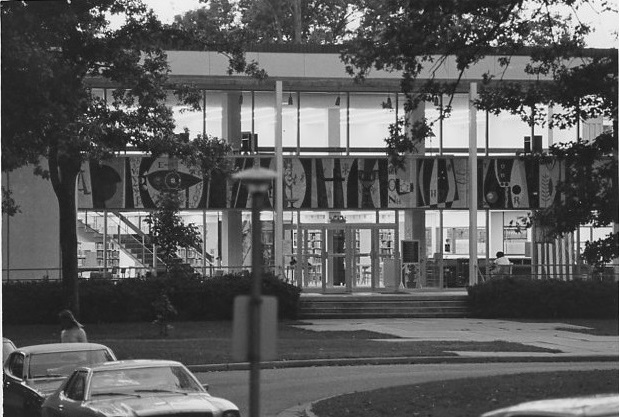 Library Portico as it originally appeared, 1965. 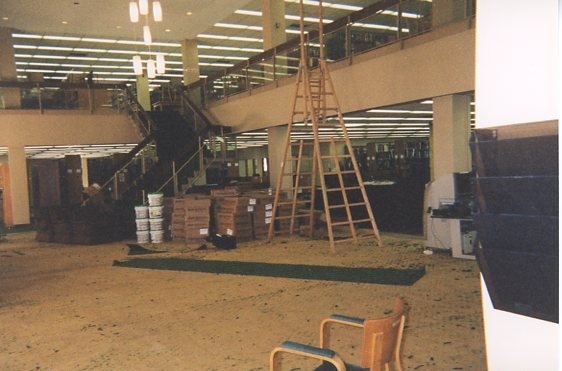 Library interior under renovation, 1998. 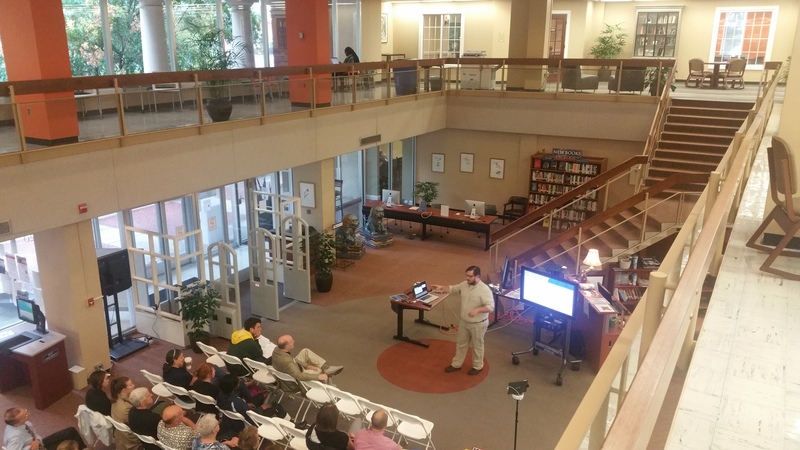 The lobby of Everett library hosts a multitude of functions. Everett Library stands ready to meet all of your research and study needs!